Haiti, a close neighbor of the US with over nine million people, was devastated by earthquake on January 12, 2010. Hundreds of thousands were killed and many more wounded. The UN estimated international donors gave Haiti over $1.6 billion in relief aid since the earthquake (about $155 per Haitian) and over $2 billion in recovery aid (about $173 per Haitian) over the last two years. Yet Haiti looks like the earthquake happened two months ago, not two years. Over half a million people remain homeless in hundreds of informal camps, most of the tons of debris from destroyed buildings still lays where it fell, and cholera, a preventable disease, was introduced into the country and is now an epidemic killing thousands and sickening hundreds of thousands more. It turns out that almost none of the money that the general public thought was going to Haiti actually went directly to Haiti. The international community chose to bypass the Haitian people, Haitian non-governmental organizations and the government of Haiti. Funds were instead diverted to other governments, international NGOs, and private companies. Despite this near total lack of control of the money by Haitians, if history is an indication, it is quite likely that the failures will ultimately be blamed on the Haitians themselves in a “blame the victim” reaction. Here are seven places where the earthquake money did and did not go. One. The largest single recipient of US earthquake money was the US government. The same holds true for donations by other countries. Right after the earthquake, the US allocated $379 million in aid and sent in 5000 troops. The Associated Press discovered that of the $379 million in initial US money promised for Haiti, most was not really money going directly, or in some cases even indirectly, to Haiti. They documented in January 2010 that thirty three cents of each of these US dollars for Haiti was actually given directly back to the US to reimburse ourselves for sending in our military. Forty two cents of each dollar went to private and public non-governmental organizations like Save the Children, the UN World Food Program and the Pan American Health Organization. Hardly any went directly to Haitians or their government. The overall $1.6 billion allocated for relief by the US was spent much the same way according to an August 2010 report by the US Congressional Research Office: $655 million was reimbursed to the Department of Defense; $220 million to Department of Health and Human Services to provide grants to individual US states to cover services for Haitian evacuees; $350 million to USAID disaster assistance; $150 million to the US Department of Agriculture for emergency food assistance; $15 million to the Department of Homeland Security for immigration fees, and so on. International assistance followed the same pattern. The UN Special Envoy for Haiti reported that of the $2.4 billion in humanitarian funding, 34 percent was provided back to the donor’s own civil and military entities for disaster response, 28 percent was given to UN agencies and non-governmental agencies (NGOs) for specific UN projects, 26 percent was given to private contractors and other NGOs, 6 percent was provided as in-kind services to recipients, 5 percent to the international and national Red Cross societies, 1 percent was provided to the government of Haiti, four tenths of one percent of the funds went to Haitian NGOs. Two. Only 1 percent of the money went to the Haitian government. Less than a penny of each dollar of US aid went to the government of Haiti, according to the Associated Press. The same is true with other international donors. The Haitian government was completely bypassed in the relief effort by the US and the international community. Three. Extremely little went to Haitian companies or Haitian non-governmental organizations. 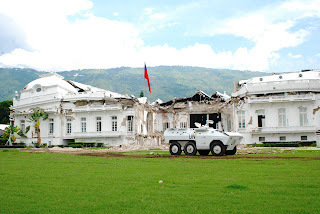 The Center for Economic and Policy Research, the absolute best source for accurate information on this issue, analyzed all the 1490 contracts awarded by the US government after the January 2010 earthquake until April 2011 and found only 23 contracts went to Haitian companies. Overall the US had awarded $194 million to contractors, $4.8 million to the 23 Haitian companies, about 2.5 percent of the total. On the other hand, contractors from the Washington DC area received $76 million or 39.4 percent of the total. As noted above, the UN documented that only four tenths of one percent of international aid went to Haitian NGOs. In fact Haitians had a hard time even getting into international aid meetings. Refugees International reported that locals were having a hard time even getting access to the international aid operational meetings inside the UN compound. “Haitian groups are either unaware of the meetings, do not have proper photo-ID passes for entry, or do not have the staff capacity to spend long hours at the compound.” Others reported that most of these international aid coordination meetings were not even being translated into Creole, the language of the majority of the people of Haiti! Four. A large percentage of the money went to international aid agencies, and big well connected non-governmental organizations (NGOs). The American Red Cross received over $486 million in donations for Haiti. It says two-thirds of the money has been contracted to relief and recovery efforts, though specific details are difficult to come by. The CEO of American Red Cross has a salary of over $500,000 per year. Look at the $8.6 million joint contract between the US Agency for International Development (USAID) with the private company CHF for debris removal in Port au Prince. CHF is politically well-connected international development company with annual budget of over $200 million whose CEO was paid $451,813 in 2009. CHF’s connection to Republicans and Democrats is illustrated by its board secretary, Lauri Fitz-Pegado, a partner with the Livingston Group LLC. The Livingston Group is headed by the former Republican Speaker-designate for the 106th Congress, Bob Livingston, doing lobbying and government relations. Ms. Fitz-Pegado, who apparently works the other side of the aisle, was appointed by President Clinton to serve in the Department of Commerce and served as a member of the foreign policy expert advisor team on the Obama for President Campaign. CHF “works in Haiti out of two spacious mansions in Port au Prince and maintains a fleet of brand new vehicles” according to Rolling Stone. Presidents George W. Bush and Bill Clinton announced a fundraising venture for Haiti on January 16, 2010. As of October 2011, the fund had received $54 million in donations. It has partnered with several Haitian and international organizations. Though most of its work appears to be admirable, it has donated $2 million to the construction of a Haitian $29 million for-profit luxury hotel. Five. Some money went to for profit companies whose business is disasters. Less than a month after the quake hit, the US Ambassador Kenneth Merten sent a cable titled “THE GOLD RUSH IS ON” as part of his situation report to Washington. In this February 1, 2010 document, made public by The Nation, Haiti Liberte and Wikileaks, Ambassador Merten reported the President of Haiti met with former General Wesley Clark for a sales presentation for a Miami-based company that builds foam core houses. Capitalizing on the disaster, Lewis Lucke, a high ranking USAID relief coordinator, met twice in his USAID capacity with the Haitian Prime Minister immediately after the quake. He then quit the agency and was hired for $30,000 a month by a Florida corporation Ashbritt (known already for its big no bid Katrina grants) and a prosperous Haitian partner to lobby for disaster contracts. Locke said “it became clear to us that if it was handled correctly the earthquake represented as much an opportunity as it did a calamity…” Ashbritt and its Haitian partner were soon granted a $10 million no bid contract. Lucke said he was instrumental in securing another $10 million contract from the World Bank and another smaller one from CHF International before their relationship ended. Six. A fair amount of the pledged money has never been actually put up. The international community decided it was not going to allow the Haiti government to direct the relief and recovery funds and insisted that two institutions be set up to approve plans and spending for the reconstruction funds going to Haiti. 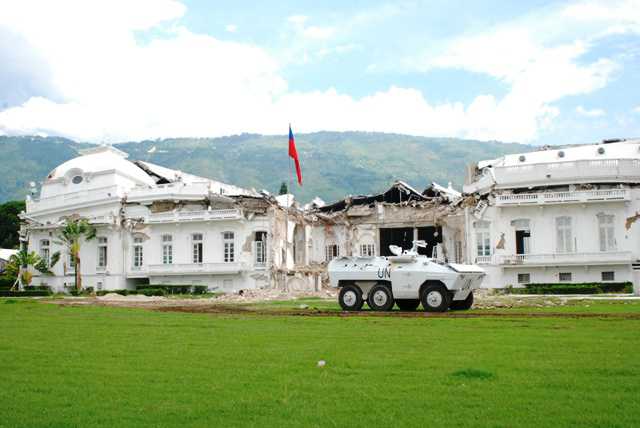 The first was the Interim Haiti Recovery Commission (IHRC) and the second is the Haiti Reconstruction Fund (HRF). In March 2010, UN countries pledged $5.3 billion over two years and a total of $9.9 billion over three years in a conference March 2010. The money was to be deposited with the World Bank and distributed by the IHRC. The IHRC was co-chaired by Bill Clinton and the Haitian Prime Minister. By July 2010, Bill Clinton reported only 10 percent of the pledges had been given to the IHRC. Seven. A lot of the money which was put up has not yet been spent. Nearly two years after the quake, less than 1 percent of the $412 million in US funds specifically allocated for infrastructure reconstruction activities in Haiti had been spent by USAID and the US State Department and only 12 percent has even been obligated according to a November 2011 report by the US Government Accountability Office (GAO). The performance of the two international commissions, the IHRC and the HRF has also been poor. The Miami Herald noted that as of July 2011, the $3.2 billion in projects approved by the IHRC only five had been completed for a total of $84 million. The Interim Haiti Recovery Commission (IHRC), which was severely criticized by Haitians and others from its beginning, has been effectively suspended since its mandate ended at the end of October 2011. The Haiti Reconstruction Fund was set up to work in tandem with the IHRC, so while its partner is suspended, it is not clear how it can move forward. The effort so far has not been based a respectful partnership between Haitians and the international community. The actions of the donor countries and the NGOs and international agencies have not been transparent so that Haitians or others can track the money and see how it has been spent. Without transparency and a respectful partnership the Haitian people cannot hold anyone accountable for what has happened in their country. That has to change. The UN Special Envoy to Haiti suggests the generous instincts of people around the world must be channeled by international actors and institutions in a way that assists in the creation of a “robust public sector and a healthy private sector.” Instead of giving the money to intermediaries, funds should be directed as much as possible to Haitian public and private institutions. A “Haiti First” policy could strengthen public systems, promote accountability, and create jobs and build skills among the Haitian people. Respect, transparency and accountability are the building blocks for human rights. Haitians deserve to know where the money has gone, what the plans are for the money still left, and to be partners in the decision-making for what is to come. After all, these are the people who will be solving the problems when the post-earthquake relief money is gone. Bill Quigley teaches at Loyola University New Orleans, is the Associate Legal Director at the Center for Constitutional Rights and volunteers with the Institute for Justice and Democracy in Haiti. He is a contributor to Hopeless: Barack Obama and the Politics of Illusion, forthcoming from AK Press. Bill can be reached at quigley77@gmail.com. Amber Ramanauskas is a lawyer and human rights researcher. A more detailed version of this article with full sources is available. Amber can be reached at gintarerama@gmail.com.